Paradigm:(par-a-digm) An example serving as a model; pattern. The Paradigm Boa is a brand new, never before seen, genetic anomaly first produced by us back in 2004. They are a product of breeding a Sharon Moore, Caramel aka Boawoman Hypo, to a Sharp Strain Albino. Below is a little information on the animals involved, and the history of our past and present breeding trials. The Caramel was produced by Sharon Moore of The Boa Store. 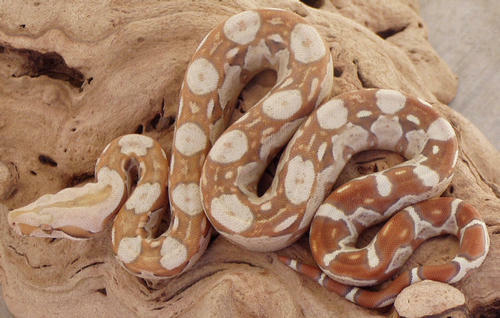 This is not to be confused with the VPI “T-Positive” Albino also known as Caramel Albinos. The ‘Moore’ Caramel color Mutation works in a simple recessive form. Sharon on two different occasions has reproduced Caramels. 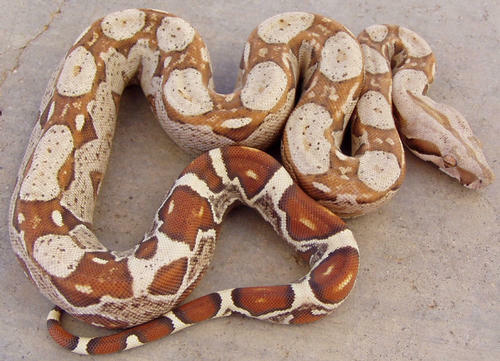 In three other breeding scenarios Caramels were bred to three separate unrelated normal Boas with all three of these breedings resulting in all normal appearing offspring Het for Caramel. When the Caramels are born there is a strong visual difference between them and their siblings, similar to Salmons and their littermates. The black on these Boas almost appears to be an ‘inky’ purple. In the breeding season of 2003/2004 we paired our male Sharp Strain Albino with our female Caramel. With this breeding we had hoped to produce some double Hets that were both Het for Sharp Strain Albino and Het for Caramel. We thought this would make for a great colored Albino as the final result. Who knew what we were going to get? What we did end up with was an entire litter of gorgeous looking babies. It appears that the combination of the Caramel Hypo and Sharp Albino genes interrupt the production of melanin or black pigment to such an extent to generate the unique look of a "T-Positive" Albino. We were not sure if the genes mutated into a single new one or if these were still double Het for Caramel Sharps? This 2005/2006 breeding season was our chance to put the male Paradigms to use and see what kind of results we could get. Our first breeding was a Paradigm X Sharp Albino. The results were astounding. This breeding resulted in 75% Sharp Albinos and 25% Paradigms. This proved the Paradigms are indeed double Hets. Our second breeding was a Paradigm X Het Sharp Albino, and again we were very pleased with the results. This breeding resulted in 25% Sharp Albinos and the remainder of the litter was ½ Paradigms and ½ normals. Those normals are now either: Het Sharp, Het Caramel or just plain normals. The normals cannot be double Hets as the double Hets are the Paradigms. We have yet to successfully breed the Paradigms to any non Sharp related Boas. In theory, the best thing about this new mutation is the "Paradigm T-Positive" Albinos can be produced in the first generation. Because the Paradigm Boa is essentially a double het for Caramel / Sharp, the offspring produced are 50% possible het for Caramel and 50% possible het for Sharp. 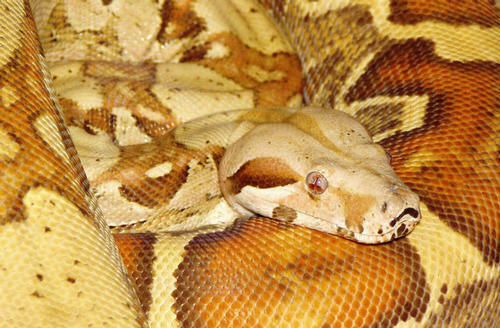 One in four offspring produced will be a Paradigm Boa! If bred to Motley, half of those Paradigm Boas will be Paradigm Motleys! When bred to an Arabesque or Jungle, the same is true. This upcoming season we hope to produce the first Super Paradigm, this being a Homozygous Sharp Homozygous Caramel Boa. This makes the Paradigm Boa an unbelievably important new color mutation that is going to bring Boa Constrictor Mutations to a whole new level!